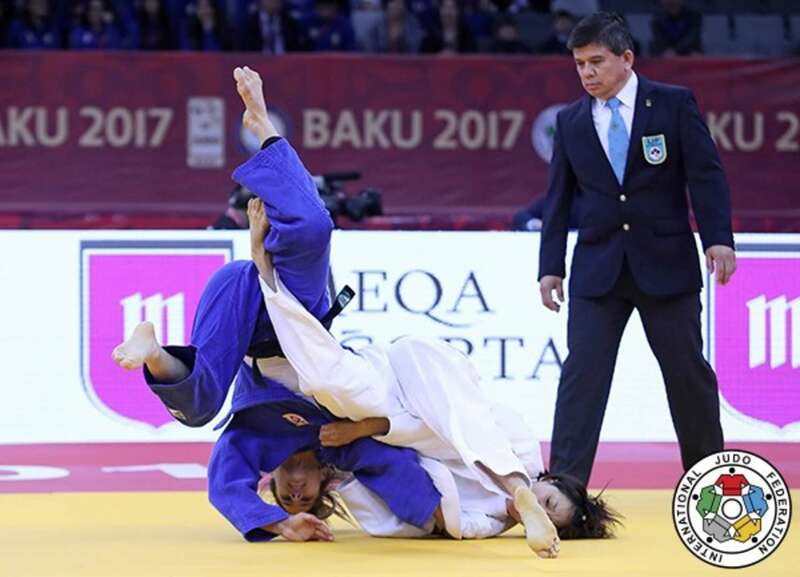 The Baku Grand Slam 2017, the second Grand Slam of the year, opened on Friday as the World Championships 2018 host city became the centre of the judo world on this European leg of the IJF World Judo Tour 2017. Baku hosted the IJF Referee and Coach seminar in January where the adjusted set of rules for 2017 were introduced to coaches and delegations ahead of the new season. 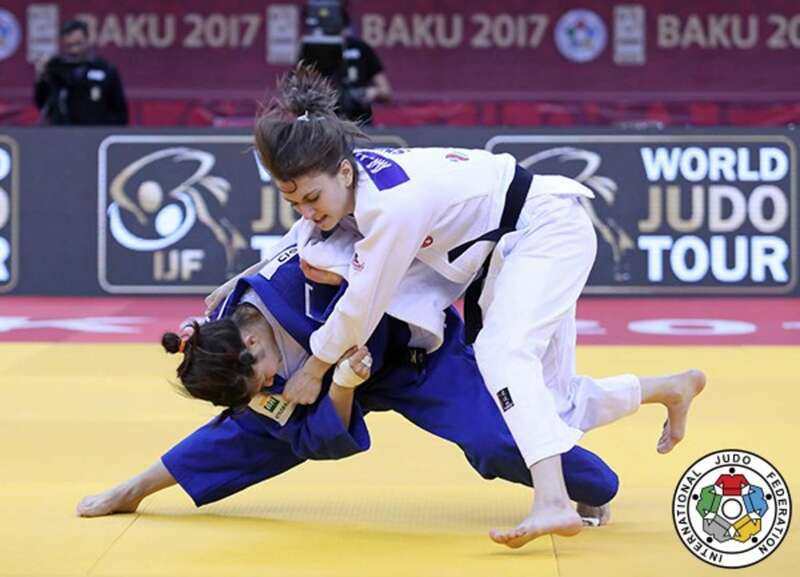 Azerbaijan’s capital city has a renowned reputation of staging first-class judo events including its annual Grand Slam and previously a Grand Prix and a World Judo Masters in 2011. Baku is one leg of five Grand Slams with Paris (FRA), Yekaterinburg (RUS), Abu Dhabi (U.A.E) and Tokyo (JPN) completing the quintet. The Azerbaijan Judo Federation and its judoka along with the international delegations in Baku this weekend are well aware of next year’s World Championships being staged in the city but are firmly focused in the moment and attaining Grand Slam honours as the IJF World Judo Tour 2017 gathers momentum towards August’s Worlds in Budapest, Hungary. Day one of #JudoBaku2017 also marked the official unveiling of the IJF’s application for a team event to be added to the Tokyo 2020 Olympic Games programme. The #JudoTeams2020 bid would see an extra day added to the schedule following seven day’s of individual action for a mixed team event composing of six judoka (3 women, -57 kg, -70kg, +70 kg, and 3 men, - 73 kg, -90 kg, +90 kg). Athletes will be those from the individual events. The proposed competition system: a quarterfinal repechage, with the four (4) best teams seeded. 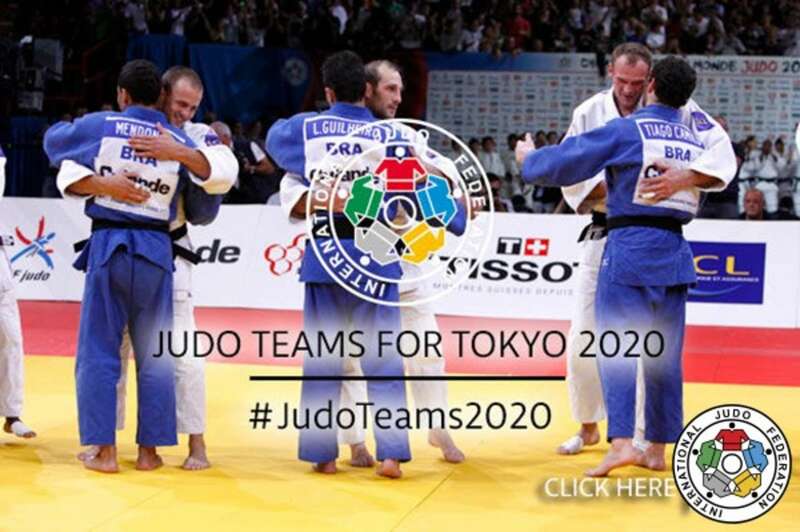 Use the hashtag #JudoTeams2020 on social media if you would like to see a team judo event on the Olympic stage. The five gold medals on the line went to five different countries as the universality of judo and its tremendous degree of competitiveness at the highest level was again on show for the world to see. Three women’s categories and two men’s categories were contested on the opening as the winners were crowned in the -48kg, -52kg and -57kg categories and the men’s -60kg and -66kg divisions. 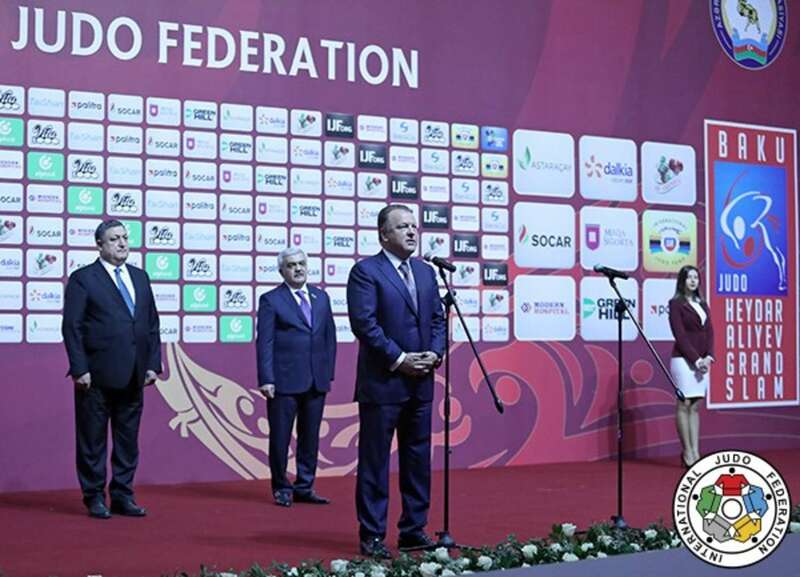 Before the first medal contests of the Baku Grand Slam 2017, the IJF and Azerbaijan Judo Federation shared the stage for opening ceremony. Mr. Ismayil ISMAYILOV, Vice Minister of Sport and Youth of Azerbaijan, made the opening address. “Welcome everyone to Baku for this fantastic competition. Sport is very important to Azerbaijan and judo is one of our favourites and most loved activities. We are performing successfully in sports and especially in judo. It is our national policy that special care and attention is given to sport. I would like also to mention that more than 50 sports events annually are held in Azerbaijan. Mr. Marius VIZER, IJF President, said: “Mr. 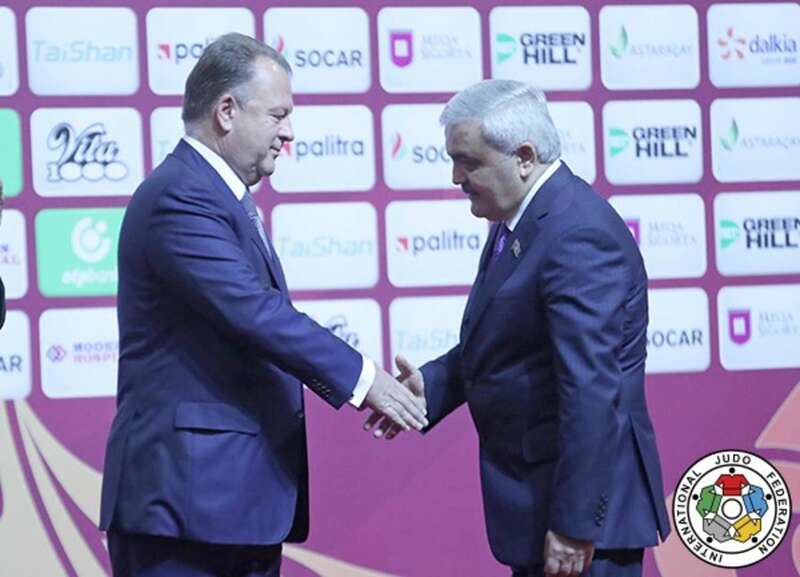 Vice Minister of Sport and Youth of Azerbaijan, Dear President ABDULLAYEV, dear judo family members, guests, ladies and gentlemen, welcome to Azerbaijan, the country of sport, culture and friendship. Mr. Rovnag ABDULLAYEV, Azerbaijan Judo Federation President, said: “Dear Mr. VIZER, dear members of the judo family, dear guests and athletes, I welcome all of you in Azerbaijan. I would like to especially thank the representatives of all countries for accepting our invitation and coming to our country. Holding this event in Azerbaijan has become a tradition and it is a great judo holiday in our country. 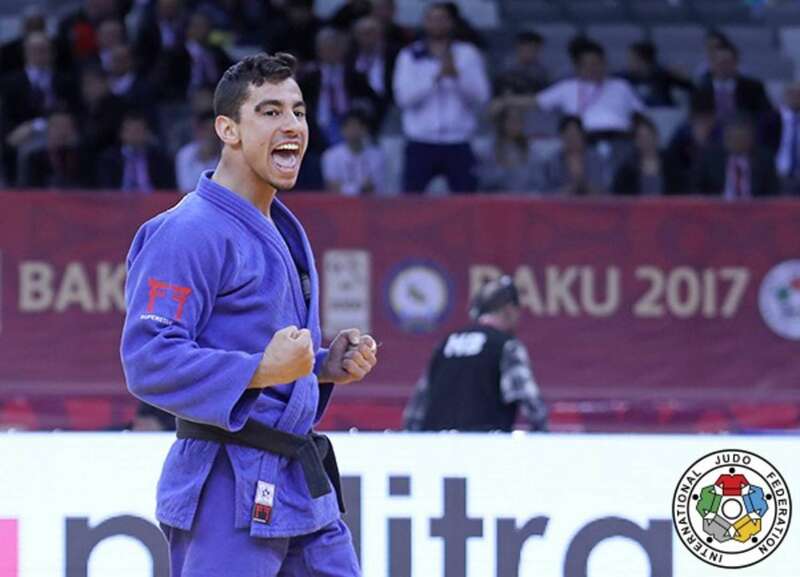 On Saturday, the second day of the Baku Grand Slam, four weight categories will be in action as the men’s -73kg and -81kg categories will compete alongside the women’s -63kg and -70kg categories with four more winners set be crowned in the land of fire. Rio 2016 Olympic silver medallist and triple world champion Yuri ALVEAR (COL) will be among the icons in action as she battles in the -70kg category on Saturday. Grand Slam rookie Stefannie Arissa KOYAMA (BRA) was the star of the -48kg category as the IJF World Judo Tour debutant won all four contests for a debut to remember. The 21-year-old still lives in her native Japan where she is in her final year of University. Brazilian pocket rocket KOYAMA had the style and frenetic pace which is associated with Japanese judoka and picked off her bewildered opponents. 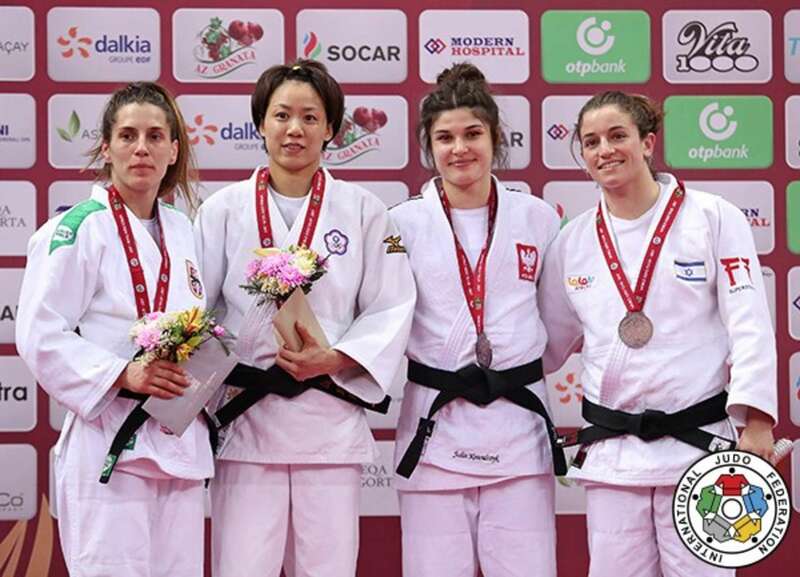 The young finalist scored a waza-ari from a ko-soto and added a second from a ko-soto-gake to become a new face in the category for a new Olympic cycle with a confident win over the favourite Milica NIKOLIC (SRB). In the first semi-final Paris Grand Slam bronze medallist Milica NIKOLIC (SRB) defeated former Paris Grand Slam bronze medallist Shira RISHONY (ISR) by a waza-ari. In the second semi-final Rio 2016 Olympian Taciana CESAR (GBS) fell to KOYAMA. Brazil-born CESAR went behind to a waza-ari from an explosive movement from the young Brazilian who immediately applied the osaekomi and the former tapped out after 12 seconds. The first bronze medal contest was won by Dusseldorf Grand Prix bronze medallist Noa MINSKER (ISR) who defeated veteran CESAR, 33, with a waza-ari which came with 15 seconds left. MINSKER, who was off with a reverse seoi-nage attempt in the first exchange, drove the African champion over finally with a morote-seoi-nage and CESAR was unable to find a reply in the closing seconds. Israel’s MINSKER will now continue her accelerated ascension up the rankings having followed her Dusseldorf podium with a first career Grand Slam medal. The second bronze medal was won by RISHONY after World Judo Masters bronze medallist Maryna CHERNIAK (UKR) received a direct hansoku-make for a waki-gatame. The Ukrainian led by a waza-ari from a sumi-gaeshi but was disqualified for the aforementioned illegal move in the closing seconds to send RISHONY onto the podium. Two of the brightest prospects in the -52kg category were matched against each other in the final in Baku as 20-year-old former Junior European champion PUPP Reka (HUN) faced Dusseldorf Grand Prix bronze medallist Alexandra-Larisa FLORIAN (ROU). FLORIAN, 21, dictated the pace from the very first exchange and was able to throw with her favoured uchi-mata for a waza-ari. 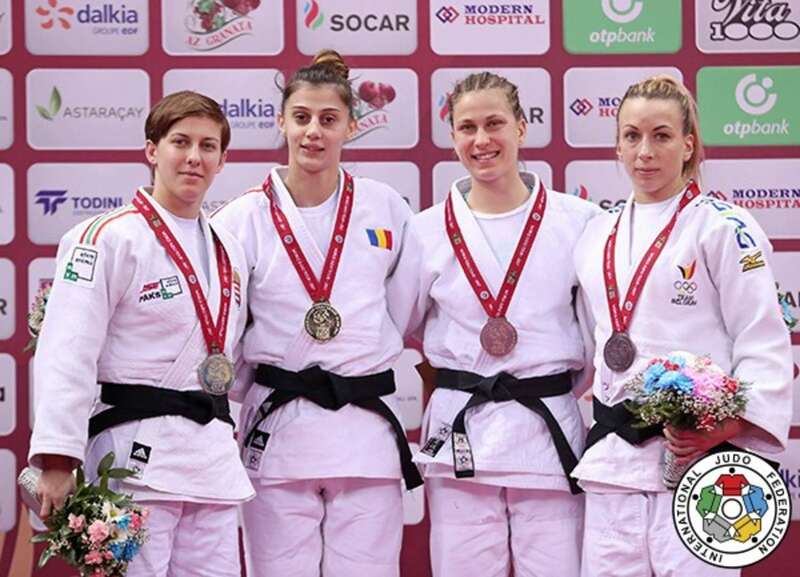 The Romanian, who started as the number two seed, was positive all day long and reaped the rewards for her first Grand Slam win and second successive medal on the IJF World Judo Tour. 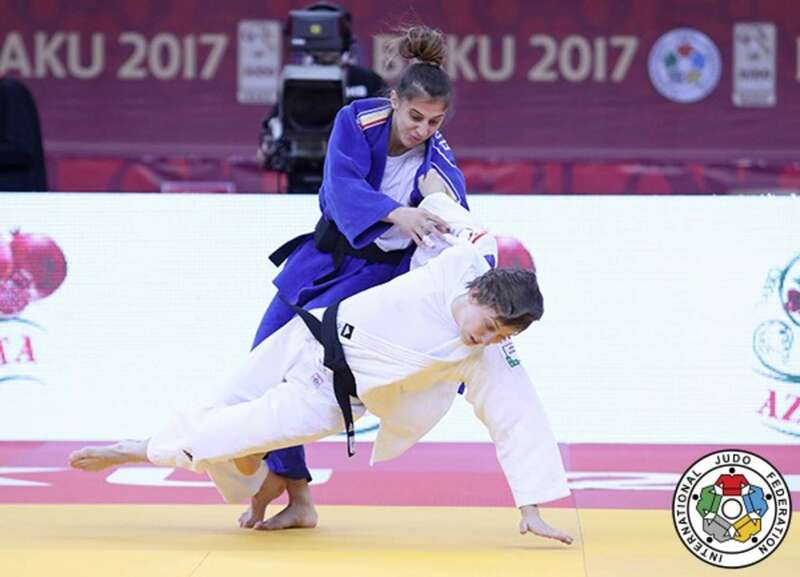 In the first semi-final world number seven Gili COHEN (ISR) was thwarted by PUPP by ippon as the Hungarian overcame the top seed with minimal resistance. In the second semi-final FLORIAN (ROU) came out on top against London 2012 Olympic champion Sarah MENEZES (BRA) as the latter received three shidos and was disqualified. FLORIAN could not hide her pleasure as she was all smiles when she bowed to her opponent and walked off the tatami to be congratulated by her coach having guaranteed her first Grand Slam medal. The first bronze medal was clinched by Tunis African Open silver medallist Anja STANGAR (SLO) who dismissed MENEZES by a waza-ari from a drop seoi-nage. The 21-year-old’s first Grand Slam appearance was a successful one and it came against the decorated Brazilian who is still adjusting to her new weight having moved up from -48kg. The second bronze medal was won by London 2012 Olympic bronze medallist Charline VAN SNICK (BEL) who showed off her ne-waza precision to capture her first IJF medal at her new weight. VAN SNICK, 26, who moved up from -48kg in December, submitted COHEN with a juji-gatame. World number 12 LIEN Chen-Ling (TPE) was one of the biggest winners on day as she defeated Dusseldorf Grand Prix bronze medallist Jovana ROGIC (SRB) to become the first Chinese Taipei judoka to win Grand Slam gold. Japan-based LIEN, 29, who was making her first start in 2017, having finished fifth at the Rio 2016 Olympics, took the contest to ROGIC and scored a waza-ari from an uchi-mata with 45 seconds remaining. In the first semi-final LIEN defeated Tashkent Grand Prix bronze medallist Sevara NISHANBAYEVA (KAZ) to the delight of the Komatsu fans in attendance. The 23-year-old Kazakh, who was making her Grand Slam debut, was trapped in a sankaku-gatame for 20 seconds and LIEN moved into the gold medal contest without breaking a sweat. In the second semi-final ROGIC saw off Junior European Championships bronze medallist Julia KOWALCZYK (POL) who received her third shido for passivity after three minutes of golden score. The first bronze medal was won by KOWALCZYK who defeated 23-year-old IJF World Judo Tour newcomer Gilmara PRUDENCIO (BRA). The Polish judoka attacked with ko-uchi-gari and then ouchi-gari to send the Brazilian over for a waza-ari and PRUDENCIO could not compete due to injury. The second bronze medal was won by European Championships bronze medallist Timna NELSON LEVY (ISR) who held down NISHANBAYEVA with a mune-gatame. 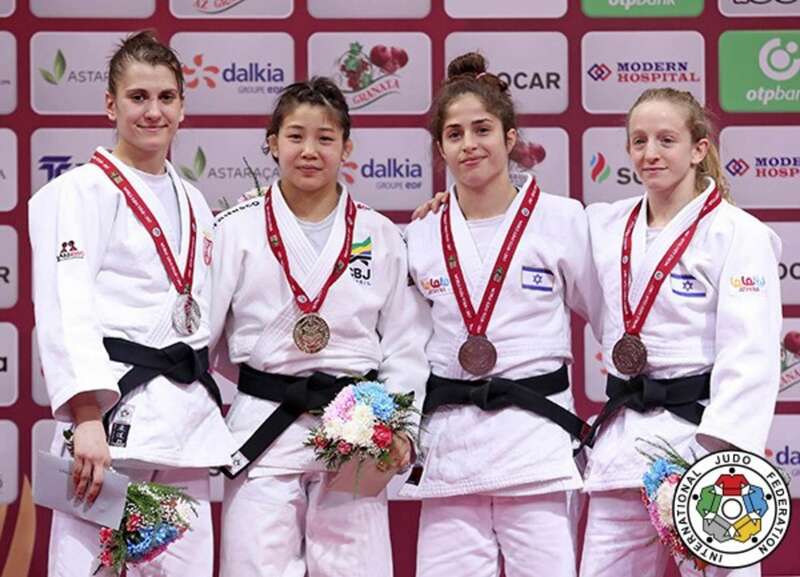 The former became the fifth Israeli to medal on day one and the third woman from their impressive team in Baku. 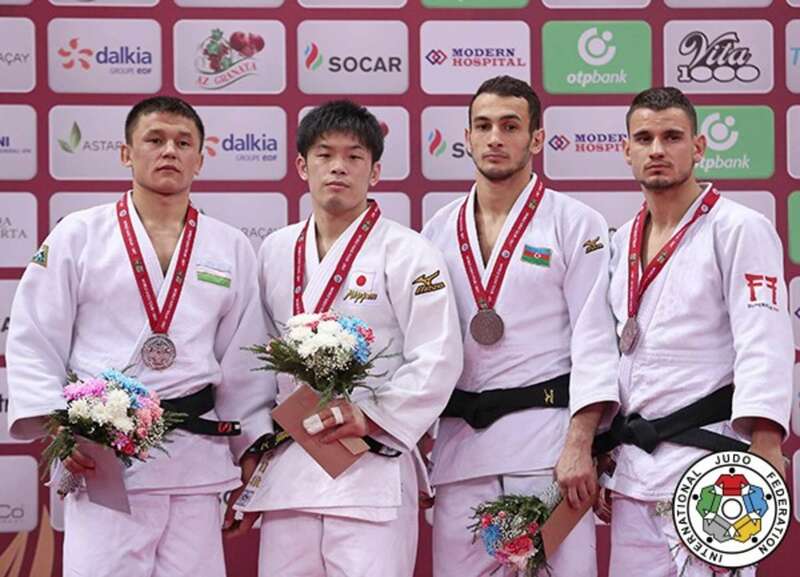 Former Paris Grand Slam winner SHISHIME Toru (JPN) was unmatched in Baku as he won -60kg gold to stand on top spot at a Grand Slam medal podium for the second time. Tashkent Grand Prix winner Mukhriddin TILOVOV (UZB) was an unexpected finalist as he opposed the Japanese in a first time encounter. World number 29 SHISHIME countered his opponent for a waza-ari and then added a waza-ari from an uchi-mata with 27 seconds left. In the first semi-final world number 73 Gusman KYRGYZBAYEV (KAZ) lost to world bronze medallist SHISHIME Toru (JPN) after receiving hansoku-make for a head dive. The Kazakh was a waza-ari down with 13 seconds left and received his marching orders for diving onto this head to evade landing on his back. In the second semi-final Tashkent Grand Prix winner Mukhriddin TILOVOV (UZB) profited from Abu Dhabi Grand Prix silver medallist Eric TAKABATAKE (BRA) receiving a third shido in golden score to be disqualified with hansoku-make. The first bronze medal was won by number one seed Orkhan SAFAROV (AZE) - his fourth Grand Slam medal - by holding down TAKABATAKE. The Azeri delivered for the home faithful as he took the lead with a waza-ari and pinned down the Brazilian with a mune-gatame and the pressure was so immense that TAKABATAKE tapped out. The second bronze medal was won by Madrid European Open silver medallist Yanislav GERCHEV (BUL) from a gigantic ura-nage against KYRGYZBAYEV after 66 seconds of golden score. That moment of magic was worth the wait for the Bulgarian who is finally off the mark on the IJF World Judo Tour. Four-time Grand Slam winner TAKAJO Tomofumi (JPN) could not make it to five on Friday as he succumb to Dusseldorf Grand Prix bronze medallist Tal FLICKER (ISR) in golden score. World number 21 TAKAJO was not at his explosive best as he went through the gears and into golden score against FLICKER was both judoka had a shido on their records with no scores after four minutes. TAKAJO, who needed to win and win well to put his name into contention for a Worlds spot, was penalised with a shido for passivity in golden score and that error saw the contest and gold medal awarded to FLICKER. In the first semi-final Paris Grand Slam bronze medallist Nijat SHIKHALIZADA (AZE) was bested by TAKAJO. After one minute of golden score TAKAJO caught the home judoka with a rapid ko-uchi-gari for ippon and a place in the final. In the second semi-final FLICKER downed u23 European Championships winner Denis VIERU (MDA) to advance to the final. The first bronze medal was won by world number 275 Lasha GIUNASHVILI (GEO) as 21-year-old VIERU let out a scream of frustration at the end of the four minutes. The Georgian opened his IJF World Judo Tour medal account by forcing over his Moldovan opponent with a te-waza movement to complete a highly-successful first Grand Slam outing while it is only a matter of time until VIERU steps into an IJF podium. 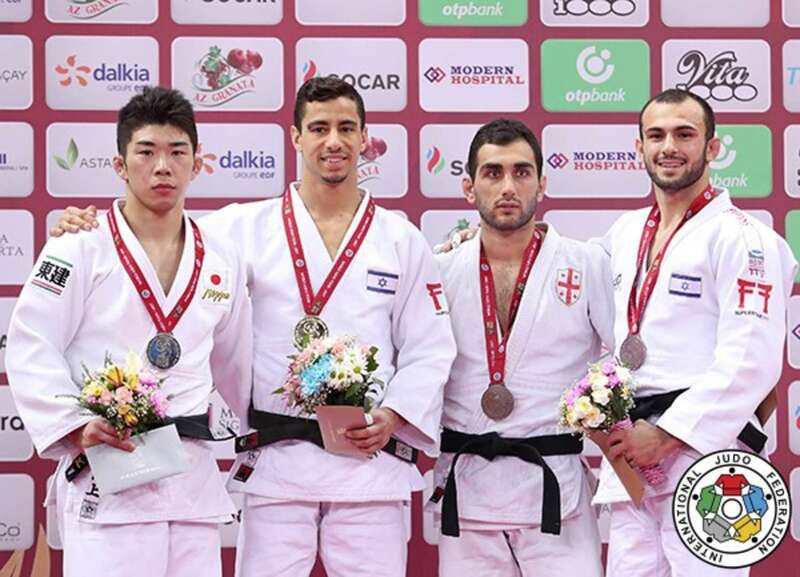 The second bronze medal went to Zagreb Grand Prix silver medallist Baruch SHMAILOV (ISR) who shut out SHIKHALIZADA and ended up a convincing winner by three waza-ari scores which went unanswered. The crowd rooted for their Azeri ace SHIKHALIZADA but SHMAILOV was in top form as Israel were heavily involved in final block on day one.